Coerver® Coaching and Rudi Skacel are delighted to announce the launch of the Coerver® Coaching “Play Like The Stars” coaching programme, which will start during February 2014. The new programme will offer young players the chance to learn how to play like their hero and help educate coaches in the finer skills of the game. Skacel had two spells with Hearts, signing on loan from Marseille in 2005 and scoring 16 goals in 35 appearances before returning on a permanent basis in 2010. During this period he kept up his impressive scoring record, netting 25 in 58 appearances including a starring role in Hearts’ 5-1 demolition of Edinburgh rivals Hibernian in the 2012 Scottish Cup final. For 30 years Coerver® Coaching has used Star Players and Teams as teaching models to help develop the next generation of young players across the globe. “Play Like The Stars” will be open to young players aged 7-14 years offering monthly training based around the star qualities of the former Czech International focusing on developing skilful, confident, creative footballers. Coerver® Coaching Director Gordon Craig said “Throughout our history we have worked with some of the game’s leading players, right back to players such as Rivelino, Matthews and Beckenbauer, using them as teaching models. We are looking forward to working with Rudi, allowing our coaches to analyse and break down some of the skills and outstanding attributes he brought to Scottish Football during his time at Hearts. He has been one of the exciting players in our game in modern years and we believe he is an outstanding role model to inspire young players”. The program will offer a monthly development session lead by Coerver® Head Coaches with Rudi attending to pass on advice and guidance to the players. Each clinic will include video analysis, question and answer with Rudi as well as intensive “serious fun” training sessions, players will also receive home assignments to practice between clinics. Coerver® Coaching have recently returned from Brazil following the delivery of the latest instalment of the FIFA™ Football For Hope project. Coerver® Coaching Directors Mike Smith (Coerver® EMEA), Manuel Ojalvo (Coerver® Spain), and Rick Moss (Coerver® Texas) conducted a Coerver® Coaching Introduction Course for 30 Brazilian coaches working with inner city/disadvantaged kids throughout Brazil (See below image). 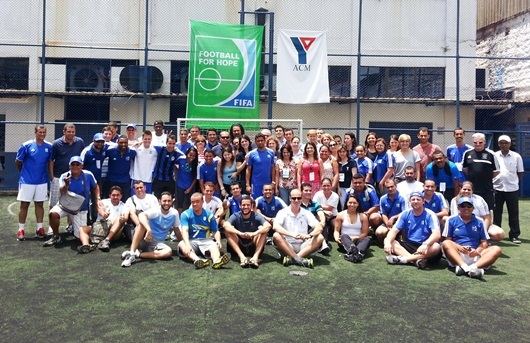 The program was organized by Street Football World and their local affiliate AMC and was sponsored by adidas®. The aim of the course was certainly NOT to teach Brazilians how to play football!, but to focus on how to use the Coerver® approach to motivate young players and excite them about training and skill development. One special event within the course was a presentation by the regional association for football for the blind, led by coach Gabriel Mayr. Urece Sport and Culture (www.urece.org.br) which is an non-profit organisation which specializes in ministering football sessions for people with visible impairments, gave course participants an opportunity to put on eye covers and find out first hand the challenges of playing without sight. With great perseverance the participants learned that it can be done. As are result of the session, Coerver® Coaching has agreed to work with the Brazilian Blind Football Association to develop a training method based on modified Coerver® drills and games. 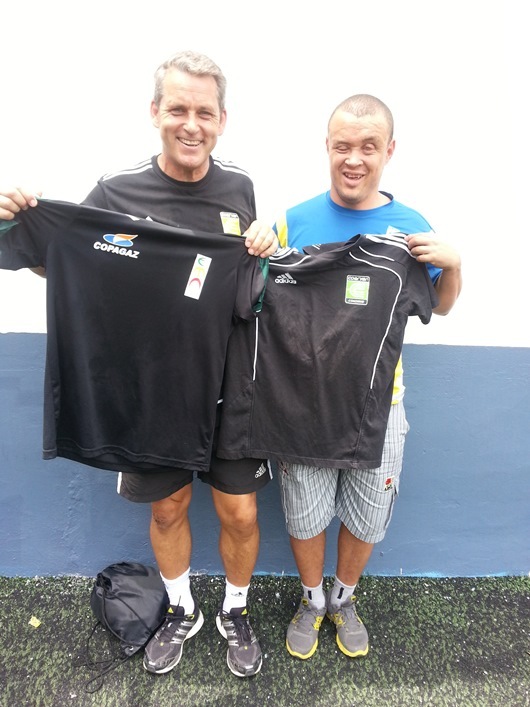 CCEMEA Director, Mike Smith, with Brazilian Blind Football Paralympian, Anderson Dias. Activities for disadvantaged kids will be at the centre of the Coerver® Coaching development focus for Brazil and we hope to supplement this by officially establishing Coerver® Coaching Brazil in 2014. Coerver® Coaching England & Wales are pleased to announce that they will be competing at the first ever Global Coerver® Cup 5 v 5 tournament, in partnership with adidas®, to take place in Madrid, Spain between 13th-18th April 2014. The tournament is being staged to celebrate the 30th anniversary of Coerver® Coaching and will bring Coerver® teams from all over the world to compete in one of the world’s most iconic football cities over six action packed days with players competing in the U11, U13 & U15 (girls) age groups. Two squads have been selected from the Performance Academy programme in England & Wales and will compete in the U11 & U13 age groups. In addition to the various teams that will be traveling to represent their respective Coerver® country there will also be a number of Coerver® Partner clubs competing in addition to squads from La Liga clubs Real Madrid CF & Atletico Madrid. 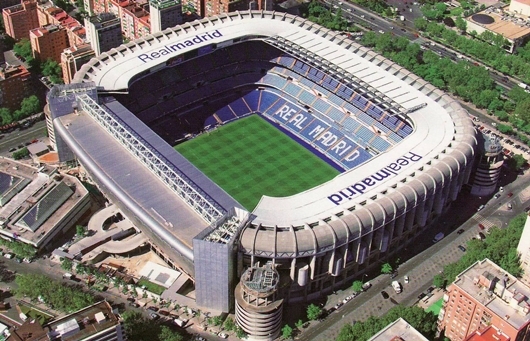 In addition to the Coerver® Cup tournament it-self, attending players and spectators will have time to take in the cultural side of Madrid with a visit also planned to the Santiago Bernabéu Stadium, home of “Los Blancos”, Real Madrid CF (see below image). Coerver® Coaching UK Director, Scott Wright commented “We are really excited to be taking two squads of players to compete in Madrid at the first ever global Coerver Cup. 2014 is a very important year for us with it being our 30th anniversary and this unique event will be bringing Coerver Players, Coaches, Parents and Partner Clubs together from all over the world”. “There are teams coming from North America, South America & Europe as well as some local La Liga clubs including Real Madrid CF & Atletico Madrid which should prove to be an unbelievable development opportunity for our players”. “The benefits on the football side of the event are clear to see but you also have the social and cultural side which for me is just an important for each players personal development. I have been lucky enough to work in Madrid three times in the last couple of years and it is definitely one of the world’s great cities for culture, food, shopping and certainly football, so I believe this will be a great event for everyone that is fortunate enough to be taking part”.